Nostalgia In Miniature Workshops: BRAND NEW WORKSHOP FOR SEPTEMBER- BOOKING NOW OPEN! BRAND NEW WORKSHOP FOR SEPTEMBER- BOOKING NOW OPEN! Do you remember when you were ever so small and all those summers just seemed so sunny, warm and endless fun? How wonderful would it be to try and recapture just a little bit of that childhood magic in a unique miniature scene. In our little back garden, "Mum" has tied the old clothes line to the top of the bird table and anchored it into the ground with an old meat skewer, as far down the lawn as it would reach. An old curtain has been flung over, weighted down at the edges with whatever came to hand. It has has made such a splendid tent for the afternoon! 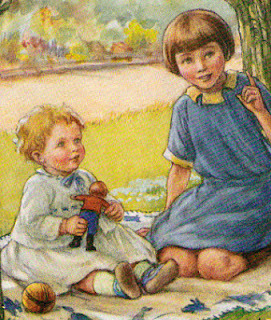 Mr Golly and Miss Dolly are out in the back garden with their assorted little friends from the toybox, for a picnic!! While Mr Golly runs around the lawn with his wooden truck, Miss Dolly is preparing tea for her much loved guests, with old pans from the kitchen and the remains of a toy teaset. Why not come and join us for the day and recreate a little bit of childhood nostalgia in this unique project - have some fun making the toys and some simple landscaping, including a very old fashioned bird table and a hedge.